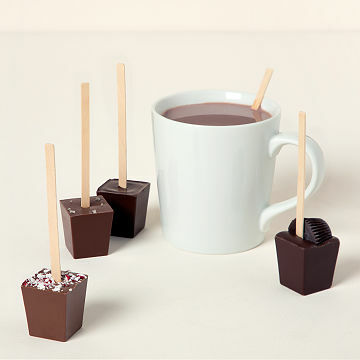 A hot chocolate set with a flavor for every kind of cold you may be coming in from. Not every chilly day is created equal. Maybe it's "Just came in from sledding" cold. Or "I can't feel my face" cold. Take cozy comfort in this hot chocolate set, which features a flavor for every kind of cold you may be coming in from: French truffle, peanut butter cup, peppermint, and salted caramel. Each is a single servingjust stir it into milk or waterand made from all-natural flavorings and couverture (fancy for "finer grounds and more cocoa butter") chocolate. There are two of each flavor, so feel free to shareor save for your next sled run. Created by Tyler Geertsen. Handmade in California. My teenage daughter loves to have hot chocolate after school or work, and she can't go back to instant powder mixes. I was able to call them having five different addresses to deliver to they were able to help me by phone to send the valentines gift to each of my grandchildren. Perfect Valentine gift for teens up north! I sent these to my niece and nephew for Valentine's Day. They were a cute alternative to boring chocolate. They loved!! Cute idea makes for the perfect gift! I bought this for a relative for her birthday... she loves hot chocolate and so I thought she would really enjoy the different flavors. I would definitely purchase this again. My kids thought these were the neatest things and love trying the different flavors!! The hot chocolate is scrumptious and you definitely want to lick the stick!!! So much fun. Easy to make yourself a wonderful indulgent cup of delicious hot chocolate. Every bit as tasty as what I get at my favorite chocolate cafe in Belgium.